Highlights surface quick actions like “Track package” and “RSVP” before you even open a message. This way you can actually do stuff, and not just view stuff with Inbox. Thanks to Google Now, Highlights also include useful info from the web — like real-time flight status and package deliveries — even if it’s not in the original email. 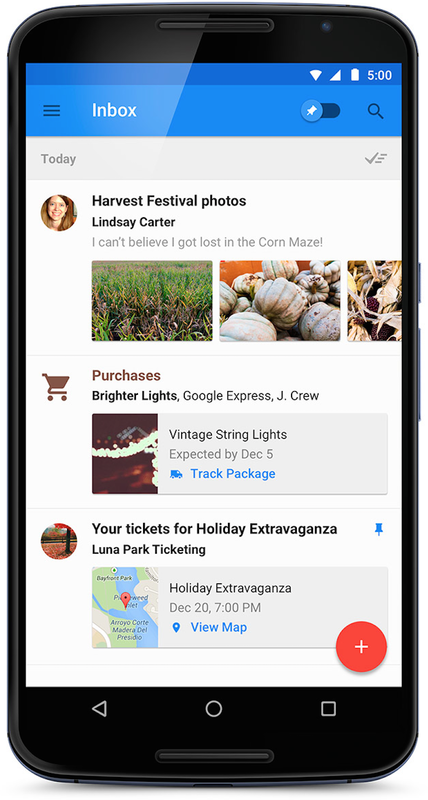 And if you’re using the new Google Calendar app, your holiday travel will be highlighted by Inbox, as well as get added to your calendar automatically. We hope Highlights help you stay on top of your email during the holidays and beyond. If you're a developer interested in Highlights, learn how to create emails with structured data on the Developer Blog. If you aren't using Inbox by Gmail yet, look for an invite from a friend or email us at inbox@google.com to get an invitation as soon as more become available.